KAMPALA– The General Court Martial on Tuesday heard that the patron of Boda Boda 2010 Association, Abudallah Kitatta had two guns in his hotel room at the time of his arrest. Corporal Alex Baguma, a driver attached to CMI told the Makidye based Military court chaired by Lt. Gen Andrew Gutti that he drove CMI operatives in a Toyota Hierce Van that had a civilian number plate and tinted glasses on January 20, 2018, to Vine Tea Hotel in Wakaliga. Baguma who was the fourth witness said that he saw Kitatta being arrested and led out of his hotel room with two guns. Court heard that Several Boda-Boda riders blocked Baguma’s car at Mengo and Nateete junction pelted stones at it and smashed its windscreen which forced him to park aside and fire two bullets to disperse the charged mob. Baguma who was asked to identify Kitatta did so and also pointed out his brother (Kitatta) Muzamir Kiwalabye who is also accused of the murder of Case clinic accountant Francis Ekalungar. However, after Baguma’s testimony, Kitatta’s lawyers led by Shaban Sanywa complained to court about prosecution bringing witnesses whom they claim are irreverent to the case against their client such as drivers. 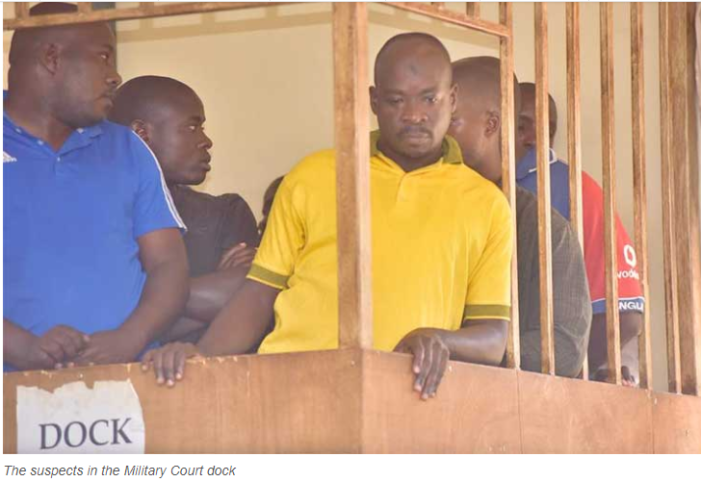 Kitatta is jointly on remand with twelve other suspects in connection with alleged charges of unlawful possession of firearms applied for bail for the second time in less than four months.